The tomatoes have been begging to be picked for days. Their fat, red orbs have been threatening to pull down the stalks. I finally got out there on Sunday, and just as I had expected, some couldn’t wait; their skins split. 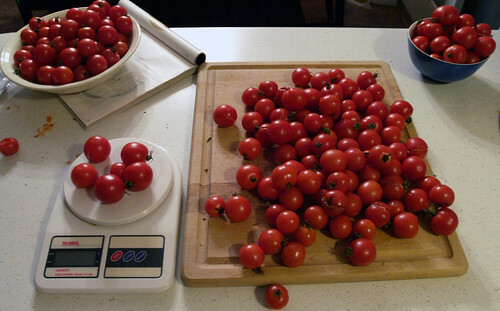 This kind of pull—7.5 pounds of cherry tomatoes in one day—needed to be made into sauce. I’ve never made tomato sauce, but the glut of ripe fruit meant I had two choices tonight: sauce or compost. I don’t have any of the proper tools for canning. I wanted something quick, because I worked all day, then class, then home to finish out the day with family responsibilities. Hovering over a pressure cooker isn’t what I wanted to do. I boiled all the tomatoes, skinned and pureed them. Tomorrow I’ll strain them through cheesecloth. I’ll add basil, garlic, and onions, and pop the whole lot in the freezer. Done! I don’t know if it’s right, but I’m sure it will taste good. Things like this will always be a challenge: a successful garden means I need to deal with what I harvest. And I don’t grow it to waste it; I grow it for my family to eat. The challenge is to figure out how to make it work when life gets in the way. No special tools needed for canning! All you need is a stock pot large enough to fit a few jars in and cover them with water, and jars and lids of course. Freezing is also a good option though if you don’t feel like canning. @Chiot’s Run: I think I’ll be freezing lots of stuff rather than canning, and I’m glad to hear it’s easier than I think. Perhaps I might try canning apples this fall. YUM!